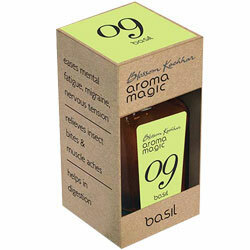 Aromamagic Basil Oil for Eases Mental fatigue, Migrain, Nervous Tension, Relieves Insect Bites & Muscle Aches. Eases Mental fatigue, Migrain, Nervous Tension. Relieves Insect Bites and Muscle Aches.